Dublin: Day 8 of 23; service for the sake of God . . .
As charitable works become praiseworthy, people often perform them merely for the sake of fame and to gain benefit for themselves, as well as to attract people's admiration. But this does not render needless the teachings of the Prophets because it is spiritual morals that are the cause of training one's innate nature and of personal progress. Thus will people offer service to one another with all their hearts for the sake of God and in order to fulfill the duties of devotion to Him and service to humanity and not for the purpose of acquiring praise and fame. Prior to his embracing this Faith, he was so dauntless and merciless that he had killed countless persons but after embracing this Faith he was entirely transformed, so much so that when once he was fired at by a pistol he did not even raise his arm in self-defense. 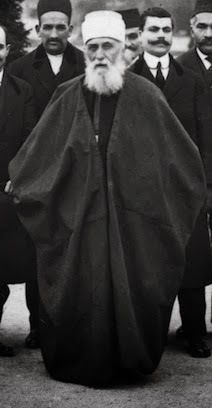 Such people become educated under the shadow of belief. . . .
At a gathering in the afternoon the Master spoke on the equality of the rights of men and women, the greatness of this cycle, the oneness of the world of humanity and God's creation. After the meeting several ministers spoke to Him. One was the pastor from the Dublin Unitarian Church who invited the Master to speak at his church." The Unitarians all along the journey seem especially open to the Master's talks. Agnes writes that about 75 people came in the afternoon, and Dr. Josiah Lafayette Seward asked Abdu'l-Baha to speak on the following Sunday. He responded that He would do so if still there. Agnes writes, "He finds the air too invigorating and tried sleeping this Friday night at the lower inn." In a second entry dated August 1, Agnes says that they went to the Henderson Camp (see yesterday's entry by Mahmud). 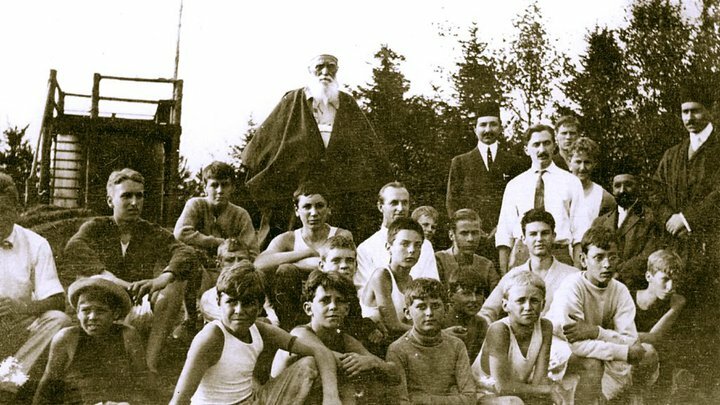 "Abdu'l-Baha was interested in everything, was shown the view from an observation platform, then the boys' sleeping places. Afterwards we had tea and just before leaving a drill was done by the boys." 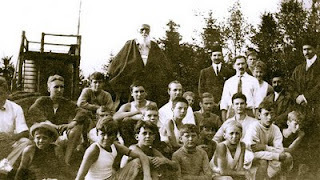 She adds that a photograph and many snapshots were taken of Abdu'l-Baha with the boys.